Should I be working for private businesses? December 14, 2010 / FOIMan / Comments Off on Should I be working for private businesses? No, I’m not about to do an Iain Dale and pack in the blog. Nor have I prepared my resignation letter in readiness for the launch of my new start-up. But, like many FOI Officers (and others in public authorities who answer requests), I spend a goodly quantity of my time preparing information for the commercial sector. Now, in principle, I don’t have a problem with this. Everybody has a right to information under FOI, and unlike the Campaign for FOI, I’m not even particularly keen on the idea of making business pay for information. But, on that basis, I don’t think business should get a ‘better’ service than anyone else. Today I’m working on one of my least favourite kinds of request. It’s not particularly difficult to answer, but then that’s part of the issue. The request asks for the names and contact details relating to a long list of job titles in our IT department. And insists that I specifically create a spreadsheet containing the information. The point is that my organisation is actually pretty open compared to many public sector bodies (more open than I really feel comfortable with when I swap my FOI hat for my Data Protection hat). We have most, if not all, of this information on our website. There is an exemption at section 21 for information that is accessible to the applicant by other means, and if this isn’t the time to use it, then I can’t think when else it could ever be used. But of course, it isn’t that easy. Section 11 obliges us to provide information in the format requested “as far as reasonably practicable”. And as the requester has helpfully pointed out through various links and quotes provided in their request, the Government has recently made clear that we should be bending over backwards to provide data to businesses. In practice, I could (and probably will) do what is being asked. But I know it irritates colleagues, as it does me. It galls on at least two levels. Firstly, is it really appropriate for me as a public employee to spend time (and therefore money) doing the requester’s job for them, effectively doing the research (which they could easily do themselves) and the data entry? Secondly, when they get that data, presumably they will then use it either to (a) send unwanted marketing emails to the staff listed, or (b) sell the data to other companies who will send unwanted marketing emails. Sometimes there’s an even better (c) where they try to sell public authorities the database effectively created by their own employees. Disclosing this data doesn’t make us any more open or accountable. Most departments in public authorities provide generic email addresses through which legitimate marketing emails (and other enquiries) can be sent and if the product or service is of interest, they will be followed up. Targeting individuals is likely to annoy potential customers more than win them over. Yet requests like this one keep pouring in to public authorities across the country. Don’t get me wrong – as I said at the start of this piece, I accept that we have a duty to provide information that is requested. And as regular readers will know, I’m a supporter of FOI and the rights that it gives people (I wouldn’t have a job without it!). But this is an example of a common type of request that puts our backs up. If you’re working for a business, and you’re putting together a mailing list, a plea – please, please, if you value our sanity, at least do a little research first before asking a public authority to provide you with contact details under FOI. And carefully consider whether your request might ultimately lose you potential business. I have had some of these such requests and don’t really recall any subsequent use of the data either in our case! If you (as an external) are looking to create goodwill and potentially build a rapport for gaining custom – making a “formal” FOI request to begin such an engagement is a extremely poor show in my opinion. I think a potential better use for some is to use the Act for why they did not get custom (e.g. tenders) although hopefully an authority would communicate this properly in any event. I have often found these requests are impersonal and round-robins, often little heard from them thereafter suggesting they were not well designed in the first place. If you can apply s21 to it, s11 doesn’t come into play at all, does it? Ganesh – I have to admit that I’m not sure! I looked into this question some time ago and couldn’t find any definitive statement in the available guidance and case law. If anyone does find anything on this, do let me know. Amazing that after all this time, there are still little things that sound simple but aren’t necessarily. Well, if the information is exempt, there’s nothing to communicate. I think the main question is whether the information is reasonably accessible or not, and from your description it sounds like it is. 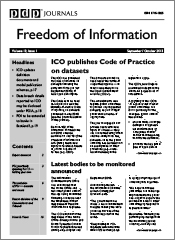 I’ve read far more extreme versions of this as FOI responses from the ICO itself (e.g. there’s one on WhatDoTheyKnow along the lines of “if you want our list of data controllers, you need to keep querying our interactive webpage for them”). I’m with Ganesh on this one – the whole point of the FOI Act was to make information accessible to the public – which is a VERY good thing. The trouble is, the more we publish, the more and more weird and wonderful (and time-consuming) the requests get. When you get requests which actually SAY “we want x/y/z for a marketing campaign” or “I’m studying [something] at university, tell me everything about …” then I have no problem telling the enquirer – effectively – to do their own homework. 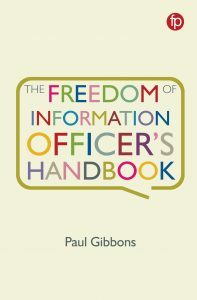 If information is on our website, or indeed on any other website then it is available through other means and in my opinion (standard disclaimer: IANAL, just an FOI admin) Section 21 applies and I respond accordingly – together with the appropriate link (Section 16: duty to advise and assist). I fail to see why public funds should be subsidising the commercial sector – because that’s what it is if we’re reproducing/retyping information “just because” the enquirer wants it in a completely different format from the way it was originally produced (disclaimer again: provision of large print or audio or other accessibility variants excepted of course). FOI may be applicant blind – but people who are quite clearly (from origin or content of e-mail) are asking for information for purposes of academic research, “research” (as in “marketing”) or in journalism should know how to find information. Making FOI requests without checking the website first is purely lazy – so what if you want the same info from 200 (made up number) organisations – you are taking up public funds. I also wish that people would understand that the buearucracy they hate so much is largely caused by the demand for accountability. I wish I had a quid for every time I’d had to explain that the level of detail in our records (e.g. accounts etc) and the format in which we can supply information are limited by our systems. I sometimes wish that someone who wants to put in a request would just pick up the damn phone (the number is on the website) and talk to me to find out what’s available first. If any enquirers are reading this – most FOI administrators are helpful. Really we are! Ganesh, I think you’re probably right in principle and in a previous case I reached the same conclusion (but couldn’t find anything to support this when the issue was explored during an internal review). The trouble with these scenarios is that it’s not quite as simple as it appears. Firstly, with most exemptions, it is quite simple – you’re saying that the information can’t be disclosed. But with s21, you’re often saying here’s the information (by pointing to a web location), but here’s the technical reason why you can’t have it. By this point most FOI Officers’ heads have exploded. Secondly, in this particular case, as with similar requests, the information on the website doesn’t QUITE answer the question. Some staff have specifically asked for their details to be removed (so the response has to cite s.40 or provide the details missing from the website). The job titles in the request don’t match the equivalent job titles in the organisation, so the requester could semi-reasonably argue that the information on the website doesn’t answer their question (I’ve received this complaint before). Thirdly, of course, the whole point of FOI is to be as open as possible, and accompanying that, we have a duty to advise and assist. That has to be balanced with use of resources, and requesters should be more responsible in their use of FOI in these cases. But unless it’s going to take a long time to prepare information in the relevant format, even if an exemption does apply, you’ve got to ask yourself whether it’s appropriate to use it. For these reasons, I eventually decided to just do as they asked (also to avoid spending too much time scratching my head over it). But it just goes to show that sometimes what seems like a really simple request can become relatively complex. On the point of section 21 and when information is reasonably accessible when it is on a website you might want to look at the Information Tribunal decision in Christopher Ames v Information Commissioner and Cabinet Office ((28 April 2008). 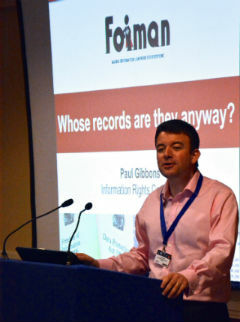 See episode 12 of my FOI Podcasts – the script can be downloaded from our website.